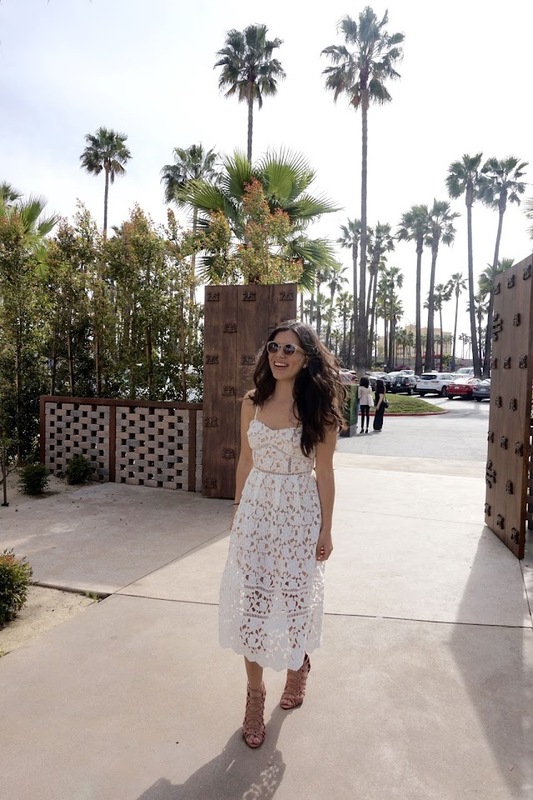 So yesterday, you read all about DAY ONE of my travel diary from my trip to California, where I attended We All Grow Summit. And today I wanted to mix it up a little bit and share what I wore on day dos... so for today's post I am sharing an outfit of the day. I love, love, loved this dress from the moment I saw it at Lulu's. It's timeless and classic and simply all around perfection. The midi was perfect for my first full day of sessions and keynote panels at WAG. I paired this dress with these amazing blush-pink-caged-heeled sandals (say that 5x fast!) and they were the most comfortable heels ever! So much so that I wore them the entire day without my feet bothering me at all! And when my feet started to hurt the following day with some other shoes, I quickly changed into these again! The weather was definitely a little chilly towards the end of the day, so I added my faux leather jacket and it actually made the dress look even better, a little edgy and still pretty. Everyone at the conference loved the dress and commented on how pretty it was, a few of you even mentioned you were definitely going to get and I say si! Go pick it up now because you are going to love it as much as I did. And it's a must-have this spring and summer season. If you missed my recap of day one you can catch it HERE. Stay tuned because I am sharing my second day at the summit this week... and don't forget that I am working on a vlog as well;) subscribe to my channel so you don't miss it, it'll be a good one! Thanks to Dani (Nany's Klozet) for taking my pics this day:) You were the best roomie ever!